oh what a fun layout!!! everyone on our block growing up had a big wheel but my parents said no because they had bought a used tricycle and my dad had painted it purlple (i loved purple)- i loved that bike BUT i so wanted a big wheel! LOL!! I am an 80's child and remember having these. All my cousins and I had them!! Fun layout! I loved my BIG WHEEL!!!! LOVED IT!!!! And I loveeeeeeeeeeee your lo!!!! Those photos are PRECIOUS and love love love the colors!! I got my package yesterday!!! Thanks so much love!!! I love love love G45 and this is just PERFECT!! You are the bestest!!! I was born in the late 60's. All of us kids rode one. You know they have made a comeback, you can buy them now. :) Makes me want to get Ben one. 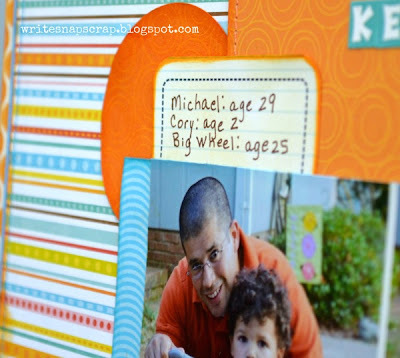 Your page perfectly commemorates the memory and day. I love the colors and all the lines and circles gives it great movement. Love the layout! 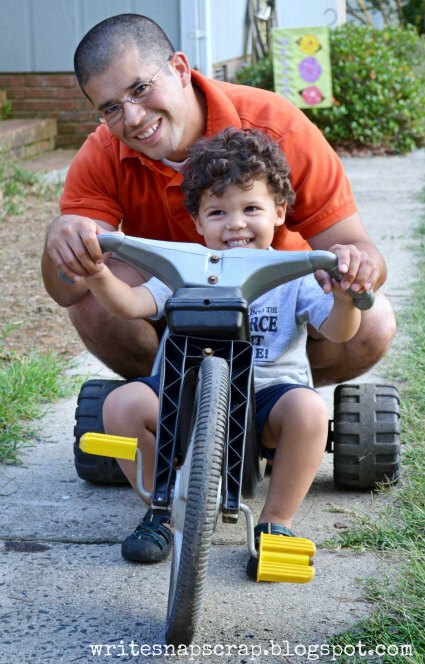 My daycare provider has several big wheels, my always riding around on one when I pick him up on nice afternoons! So cute and fun!! Love those delightful pics!! Awww!!! Adorable layout and that picture is amazing! Great photos and awesome layout! Oh big wheels! Aaawwww...great layout and pictures! Too funny you should post about the big wheel. My nephew is turning two and my mom wants to buy one for him. Apparently my brother had one and LOVED it too! Great story and layout! I had a big wheel too! I loved my big wheel! Such a great layout and memory! 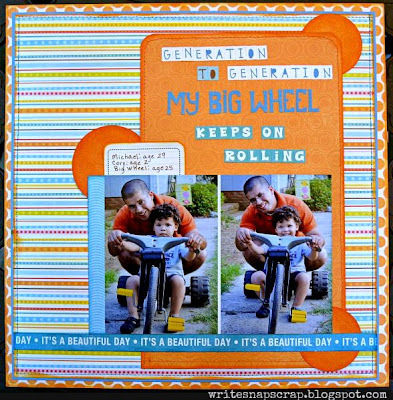 I loved my Big Wheel! My parents kept just about everything from my childhood, but not the Big Wheel. Too bad- it's such a fun toy. I love what you did with the layout, especially listing the ages of Michael, Cory and the Big Wheel. My kids LOVED their big wheels! We were wondering why they aren't all around these days! Cute layout. Both my boys had a big wheel and loved it! Great layout! Even I used to love my brother's big wheel - "stole" it from him every chance I got - it's wonderful to see another generation enjoying them (and I love your layout)! This is such a fun layout, with the bright and happy colours! Lovely work!